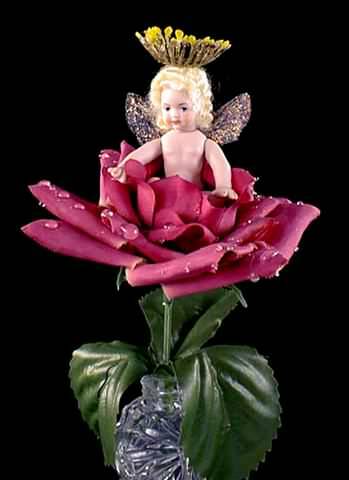 Rosey, the Little Rose Fairy! Meet Rosey, the cutest tiny little Rose fairy you ever saw! She is so perfect in her beautiful, dewy rose, wearing nothing but her wings, her stamen "crown", and a smile! 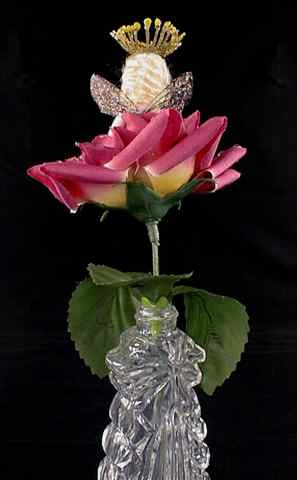 Her rose is growing out of a heavy, antique cut glass perfume bottle. Rosey can be removed from her rose when she wants to flap her wings. Her tiny wings are hand-made and hand-painted. She is guaranteed to make you smile every time you get a glimpse of her! Rosey is a handpainted porcelain miniature fairy doll, about 11/2" tall from head to foot. Her wingspan is about 2". Overall, she is 81/2" high to the top of her crown. Her perfume bottle is 5" high. A fabulous, one-of-a-kind work of art by the artist JoAnnJ of Galleria d'Juliani. She is hand signed by the artist. Fairy Rosey in her Rose!